What is Fracking and why don’t people like it? When I first heard about fracking and some peoples concerns that fracking can cause water pollution and earthquakes, I had assumed that fracking somehow involved the detonation of explosives underground. 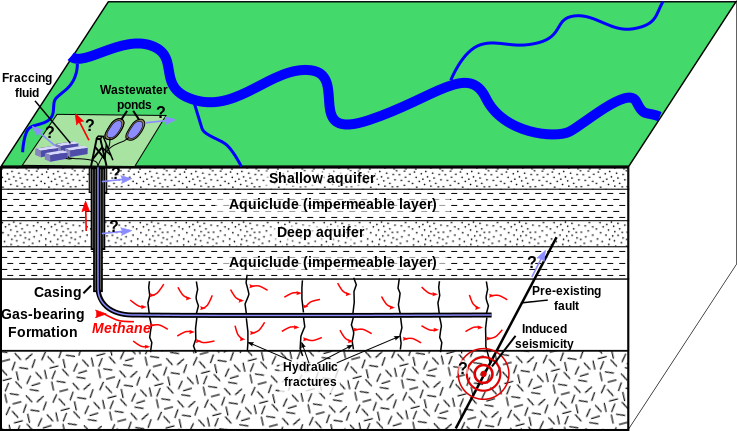 As it turns out, the modern fracking that has been in the UK new recently, has nothing to do with huge, subterranean explosions at all, but is a method of forcing pressurised liquid into rocks to cause fractures and release gas and oil. 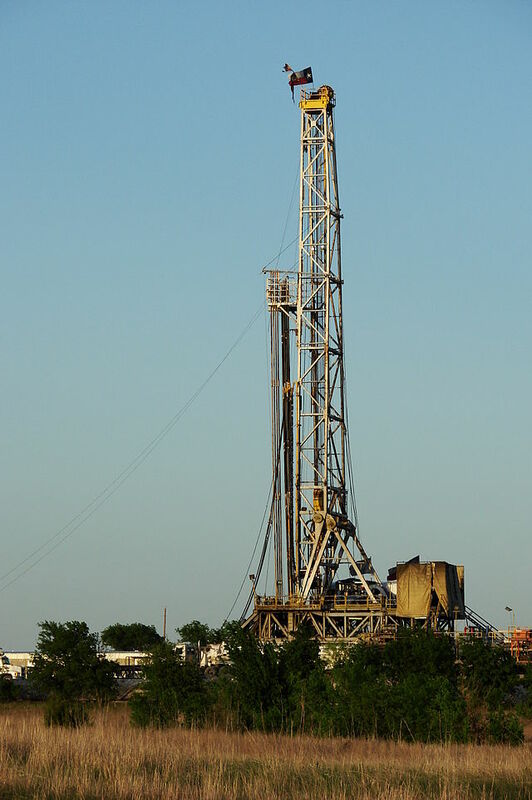 Fracking was first used to stimulate the production of oil from rock formations as far back as the 1860’s and, initially, explosives were indeed used to create fractures in the rock. Since then, fracking has been used in many oil and gas fields around the world, including those in the North Sea. But, it is the more recent use of fracking to extract natural gas from inland shale deposits that has been causing the controversy. Schematic depiction of hydraulic fracturing for shale gas. 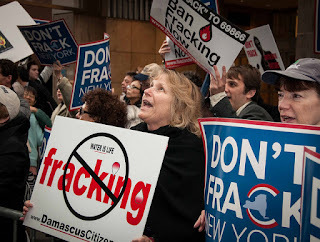 Fracking, is the common phrase used to describe hydraulic fracturing, also known as ‘hydrofracturing’, or ‘hydrofracking’. Whatever name you wish to put to it, fracking is the process whereby pressurised liquid is forced into a wellbore to create cracks within the surrounding rock structure. The liquid that is forced into the rock contains chemicals and usually sand, or aluminium oxide. The objective of the process is to force open cracks in the rock with the fracking liquid so that, when the hydraulic pressure is removed, the liquid will escape, but particles of the sand, or aluminium oxide, will remain and keep the cracks in the rock open and allow the gas or oil to escape. Why all the controversy over fracking? While some will argue the economic case for fracking, there are many more who will argue that the environmental costs are too great. It is believed that fracking could release huge, previously untapped, reserves of natural gas from shale deposits on the UK mainland and provide the country with a secure gas supply from within its own borders. This would mean that, not only would the UK not have to rely so much on imported gas, but also that the price of natural gas in the UK would go down. On the other hand, fracking requires the use of huge amounts of water, which will often have to be transported overland, causing massive environmental damage. Environmentalists also point to the potential dangers of water pollution from the chemicals used in fracking and there is also evidence that fracking has caused small earth tremors in the UK. Until someone invents a truly clean source of energy, the argument of environment and safety Vs cheap and reliable energy sources will always rage. Windfarms are unsightly and make too much noise, nuclear fuel is dangerous, and fracking causes earthquakes, but we all want to turn on or lights and sit at our computers in our warm homes and complain about it. What’s more, even as some people in western countries are becoming more energy conscious, newly developing countries are becoming thirstier for energy, and they are unlikely to forego economic prosperity in favour of a greener planet. Having researched the pros and the cons of fracking in the UK, the strongest argument that I can see, against the use of fracking, is the simple one of all; we don’t actually need it! If that is the case, why then are we even contemplating the risk of earth tremors and groundwater pollution?